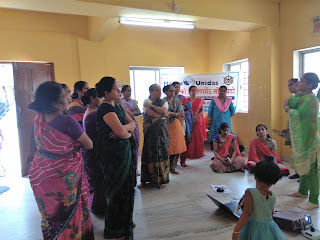 11-Apr-2018, Pune: The Don Bosco Development Society (DBDS) Pune, organized an interactive training session on ‘Savings And Investment Schemes’ for the women in Subhash Nagar slum in Pune. 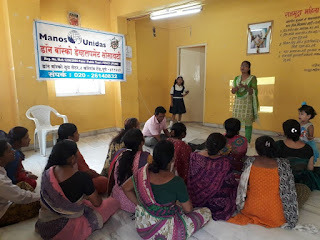 22 women participated in this training program held under the aegis of ‘Women Empowerment Project’ supported by Manos Unidas, Spain. The objective of this programme was to create awareness on the saving schemes and prevent people from falling prey to Ponzy schemes. 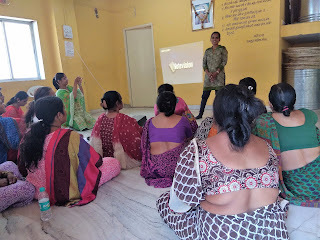 Ms. Nilima Chandhare (Trainer-DBDS) welcomed the participants and introduced them to the works of DBDS. 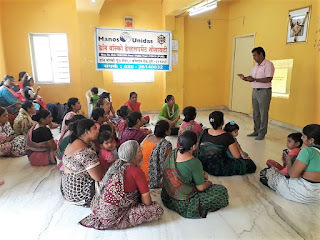 Mr. Nagsen Chavan (Coordinator-DBDS) was the resource person for this training workshop; he explained various ponzy schemes in which people lost their savings such as Speak Asia Online, Royal Twinkle Star Club Ltd, Pearl, Pancard, Samrudha Jivan Yojan, Stock Guru India etc. He also explained how these schemes work and advised them to keep away from such schemes. In the second part he explained about the investment and insurance schemes such as PPF, Sukanya Samriddhi Yojana, Pradhan Mantri Suraksha Bima Yojana, Atal Pension Yojana, Post office small saving schemes etc. Participants were actively involved during the programme. Program ended with vote of thanks by Ms Jyoti Sonwane (Staff - DBDS).